After a very nice visit and lunch at Red Lobster with Kyle, Bill's oldest grandson, we went to the Pueblo Reservoir. They have an R/C runway so Bill flew his plane - which he had conveniently put in the trunk of the car before we left home. After a short flight, the wind picked up, so he landed his plane and we drove around the park. It was hot in Pueblo - probably 10 degrees hotter than Colorado Springs. 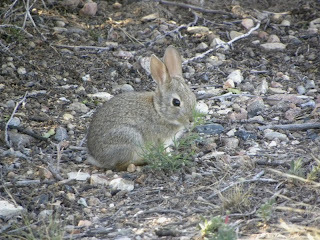 Just look at this cute little bunny rabbit. It was small enough that I could have held it in the palm of my hand. We don't see too many rabbits here in town so this was a delightful encounter. I hope he stays away from the hawks and the coyotes and doesn't become the main course at a future outdoor dinner party. 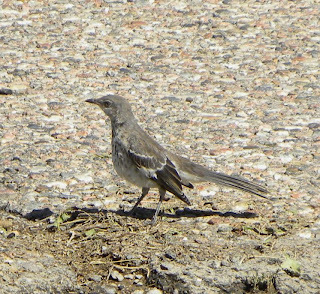 We saw several Northern Mocking-birds. 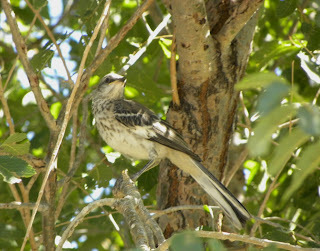 They have white patches on their wings that you can see when they fly (or "display" during mating and when hunting for insects) and a long tail that is often pointing upwards. We didn't hear him sing, but they are known to mimic other birds. Here he is again on the ground near a puddle. It looked like he was doing a broken wing impression to scare us away - but that's what a Killdeer does - not a Mockingbird! 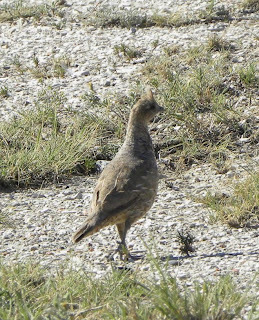 In the fall, Scaled Quail gather in coveys of 50 or more birds that feed and roost together. 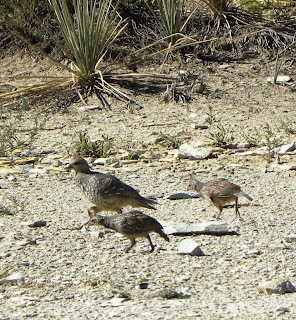 We saw a large family scurrying around and running to hide among the Yucca. 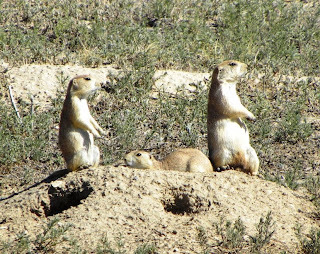 The Prairie Dogs were everywhere! I was hoping we would see a Burrowing Owl near the burrows, but we didn't. Guess I'll have to wait to see them again in Cape Coral. 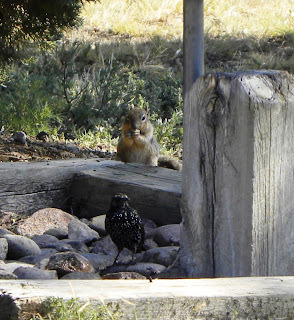 This might look like a squirrel, but it's a marmot. The bird is, of course, a European Starling. 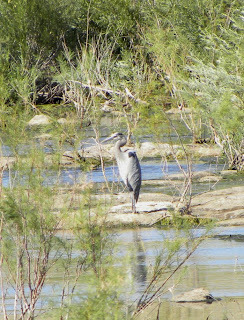 Down by the reservoir, behind the dam, we saw several different ducks, a couple of gulls (probably California Gulls) and this huge Great Blue Heron. Most of the Colorado herons migrate to more southern states, Mexico, Central and South America, but some stay all year around. They remind me of Florida - but, then again, everything this time of year as the days get shorter and the temperatures fall, reminds me of Florida. Bill and I are toying with the idea of buying a place in Ocala, Florida - north of Orlando. The community of Top of the World (TOTW) has a very active RC model airplane club which appeals to Bill. I have mixed feelings. The ocean is over an hour away and since it is northern Florida, it is colder. On the plus side, it is a gated community with tons of other activities, hiking trails, nature preserves, a couple of pools, restaurants and entertainment. You can get everywhere by golfcart and prices for resale properties are down 40% from a few years ago. It's near Walt Disney World - but not Sanibel or the Everglades. It's a Retirement Community. I feel so old.